Any code created by Roxbury Dynamic must not be modified or reverse engineered in any way, under any circumstances. This will be seen as a breach of trust and grounds for the cessation of service with immediate effect. Legal proceedings may also be taken against individuals or companies. Any graphics, images, depictions, etc. used in work carried out on your behalf by Roxbury Dynamic, regardless of the medium (leaflet design, web design, business card design, print work, graphic reproduction, word processing etc), must be the intellectual property of the client or company you represent, or used with permission from the relevant authority/owner of the copyright material. 2.1 In the event of legal proceedings being taken all copyright material will be exclusively the responsibility of the client or company you represent. You will be charged an agreed amount for hosting at an agreed interval. 3.1 Unless agreed otherwise, the first charges for hosting will be due 30 calendar days after the date when both parties agree the site is "live". 3.2 In the event of a missed hosting payment, Roxbury Dynamic reserve the right to discontinue service after a 30 day grace period. If payment is made within the grace period, along with arrears at the agreed rate, services will continue uninterrupted. 3.3 Roxbury Dynamic reserves the right to alter hosting charges at the rate of national inflation. 3.4 In the event that the client or the company they represent choose to host online product with another provider Roxbury Dynamic relinquish any responsibility for the content. Under certain circumstances Roxbury Dynamic will assist with the transfer / upload. Roxbury Dynamic in no way guarantees uptime for any online product. Clients must also understand that any online product will periodically require maintenance and upgrades. Roxbury Dynamic reserves the right to alter any product at any time without prior notice. This will always be done in the best interest of the client as new features become available or system-wide changes are required. New web browsers are released all the time, and existing browsers are updated regularly. As such, online products supplied by Roxbury Dynamic may not be fully compliant with every future web browser. We will always test our work with several of the most popular web browsers. Search engines regularly change the way they work. It is therefore impossible to guarantee a specific position or rank on search engines. In the event that you wish to alter the code of your website, either yourself or via a third party, Roxbury Dynamic should be informed. In some cases altering the code of the site may have detrimental effects to Search Engine Optimisation, or possibly affect the way the site functions. In this event Roxbury Dynamic relinquish responsibility for the functionality of the website. We can, in most cases, supply you with all relevant source code for your website. Please be aware that some elements depend upon server configuration, and may not function correctly when served from another location. 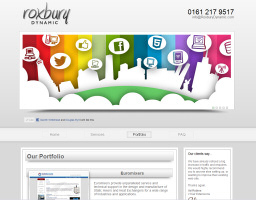 Roxbury Dynamic consider all digital content created for a client to be the property of the client. This excludes code that is used on a licensed basis (eg, third-party software and Control Centres). Typically, a price will be agreed before commencement of any work. Quotations are valid for six months from date of delivery, excluding purchased items. 11.1 Estimates, quotes and invoices can be provided in hard copy format upon request. 11.2 Clients are required to carry out their own review of any digital content prior to payment. Upon payment for work carried out, the project will be deemed completed to a satisfactory level. Any issues that arise during client review must be brought to our attention immediately. 11.3 Upon completion of a given project payment should be made within 14 days. Late payments may incur additional charges. 11.4 If payment is not made within the 14 day period Roxbury Dynamic reserve the right to cease service. 11.5 Any verbal contract from the client or nominee will be considered an agreement and authority to carry out work. 11.6. Stage payments may be required for particularly large or complex projects. The balance will be paid upon satisfactory completion of the project. Due to the nature of our work we offer no guarantee concerning completion dates. Roxbury Dynamic will endeavour to complete projects within an agreed timeframe, where required. Roxbury Dynamic reserves the right to refuse service at any time. 13.1 In the event of termination, Roxbury Dynamic can supply all relevant code and files for any given product with the exception of a Control Centre or related software. 13.2 Roxbury Dynamic reserves the right to deny access to any given Control Centre or variation. If you have purchased a Control Centre license or commissioned a variation or hybrid system you have used the system on a licensed basis and the system remains the property of Roxbury Dynamic. Roxbury Dynamic may, if required, carry out software troubleshooting or repairs to hardware. No warranty or guarantee is offered for the work carried out. Be aware that work on hardware may invalidate manufacturer's warranties. We can register domain names on your behalf. Should you later require a domain transfer, change of ownership or other change of details, we can carry out these changes on your behalf. A charge will apply from the registrar as well as an administrative fee. 15.1 It should be noted that domain prices fluctuate, and domain prices quoted are not guaranteed. 15.2 We will typically attempt to contact you one month prior to the expiry of a domain. If you wish to allow a domain to expire you must let us know at least one month prior to the domain's expiry date. Roxbury Dynamic conform to all relevant data protection laws. Employees of Roxbury Dynamic may be required to view information you have stored within online products (such as Control Centres) as part of routine maintenance or repair. This includes all aspects of data storage. 16.1 Roxbury Dynamic products must not be used to infringe on data protection regulations. Should legal issues arise relating to work carried out by Roxbury Dynamic it is the client's responsibility to bring the subject to the attention of Roxbury Dynamic. These terms and conditions are subject to change. Please check our website for the latest issue.